As many of you know, Dimecoin Network was recently subject to multiple 51% and double spend attacks of their cryptocurrency, Dimecoin (DIME). An update which included Automatic Checkpointing was released to aid in preventing such attacks and allowed for trading to be resumed across each exchange. To further bolster security, add additional stability to the network, and serve as a stepping stone for POS/MN integration, Dimecoin Network has released the latest version of their core wallet, version 1.10.0.0. This update includes the introduction of LWMA-3 (Linearly Weighted Moving Average) and an adjusted block reward distribution. Currently, Dimecoin’s difficulty adjustment is not fast enough and is subject to profit-switch miners who leave the network for more profitable coins as soon as difficulty becomes too high. This situation worsens when the block reward drops -- a product of the current difficulty adjustment -- since there was previously a variable block reward. Previous block rewards would range from 16 to 16384 DIME. After block 3310000, there will be a fixed block reward of 8,192 DIME, set to decrease 8% per year. This is especially prevalent due to ASIC mining and the ability to rent high amounts of hashing power which did not exist at Dimecoin’s inception. LWMA-3 makes the network much more responsive to real-time hashing changes. Thus, further securing the network from hash attacks and also aids in preventing timestamp manipulation. 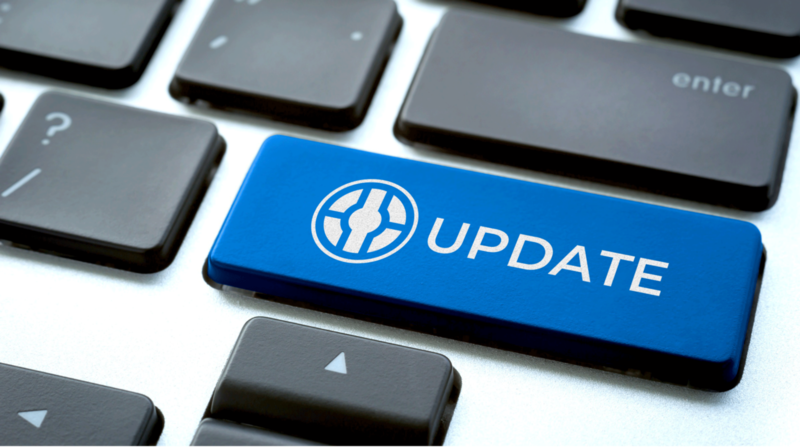 Updating is mandatory and is required to be completed prior to block 3310000. Failure to update will result in versions previous 1.10.0.0 being unable to communicate with the network. Do not worry, you can still update afterwards but your wallet will not sync until you do. Before performing any updates or changes you should always make sure to backup your existing wallet and store your private keys (wallet.dat) in a safe place. Creating a backup is entirely for precautionary reasons and is just in case anything were to go wrong during the update. If you lose your private keys and something happens, there is no way to recover your coins. Once your wallet has been backed up, proceed to update to version 1.10.0.0 through the link provided above. You can install over the top of the existing wallet so there is no need to uninstall the previous version. Your balance will reflect once the blockchain fully syncs. Any additional questions, please join our support group for further assistance. Many concerns have been expressed regarding the increased amount of confirmations needed for deposits and withdrawals across some of the exchanges in which Dimecoin trades. These increased confirmations were essential in initially deterring some of the attacks which were ongoing. At this point, we will be requesting a reduction in the number of confirmations needed and are asking exchanges to return to confirmation levels which were previously seen prior to any attacks on our network. Ultimately, it will be up to each exchange to decide how they will proceed in this regard; however, the Dimecoin Team feels it is now safe to reduce the number of confirmations required. *LWMA code credited to Zawy12. Adjustments to LWMA leading to the creation of LWMA-3 is credited to Microbitcoin. **Article updated 01/02/2019 to include the release of the latest version of the core wallet.